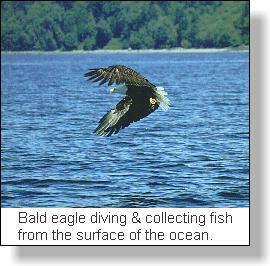 "Reading the Land and the Water for Salmon Fly Fishing Locations"
This is the Bald Eagle's aerie! It is a 'wild' location, one which makes you realize that we are each but a mote in our world. But, it is not an uncommon west coast location in British Columbia's 4000 plus miles of coastal fiords. In fact, it is likely more representative of our salmon sports fishing locations than any other in the Pacific northwest. Bald Eagles patrol these areas on a regular basis, and, at each major protruding point of land, the white head of these majestic predators is quickly spotted at the top of a weather formed but dominating evergreen tree. This is the Eagle's solitary aerie, his lookout where he perches while he watches the changing undulating ocean waters for surface fish. I have come to regard these lonely but lofty predators as true friends in our majestic Pacific coastal wilderness. Many I have found will come when I call and take the bottomfish I offer. They respond quickly to my whistle and grab the floating bottomfish in a dramatic talon extended swoop, often very close to the boat. 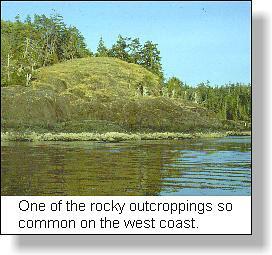 One representation of these 'wild' areas that I like to fish are the rock bluffs off our numerous Gulf Islands. These are characteristic areas typical of the west coast environment. Sheer rock bluffs rise above the waters of the Strait of Georgia, often reaching heights well over 500 feet. Wind swept fir, pine, yew and arbutus evergreens cling tenaciously to cracks in the rocks where scant levels of soil have collected over the centuries. Depending upon location, these timber monarchs of protected valleys are, in these exposed bluffs, but miniaturised stunted representatives of their race. They are scant and wind blown, often with bleached bark on open windward sides. The tide line on the shore is made obvious by clinging poppingwrack seaweeds attached to barnacle encrusted rocks at the intertidal zone. In some small bays and rock outcropping points, kelp sways back and forth with the flooding or receding tide, for the ocean water are never still. This is what I like to experience as 'wilderness' saltwater salmon fly fishing. Usually I am alone in these locations, free to experiment with fly line depths and weighted flies on underwater pinnacles, shoals, drop-offs, rock shelves and submerged ledges. The salmon are here but they are very specific to the various rock structures that these 'wilderness' area provide. For the salmon, it is for the concentrations of bait that they search. But, once these have been found, the salmon are certain to return should they have paused in these waters, inhibiting the overwhelming migrating urge that moves them through the vast waters of the Strait towards their natal streams. Studying the cliffs along the shoreline and watching the changes of depths on my depth sounder it is obvious that these same surface cliffs extended downward below me. As a Montana friend once remarked about prairie coulees, these coastal underwater cliffs are those 'upside down mountains'! Studying a marine chart is one practical skill that the saltwater fly fisher does every trip he takes on the water. Once he becomes familiar with the topographical lines that mark varying depths, exactly as surface topographic map lines show mountain slopes, draws, benches and river courses, the fly fisher can plot the best location for intercepting feeding salmon. I have found it almost uncanny how specific small locations in the vast stretches of 'upside down mountains' hold feeding salmon. Obviously there are baitfish in the area but there is something else as well which concentrates the salmon. One common factor which has proven itself over the years has been the proximity of a sheer deep drop-off at the salmon concentration. Only in this one location do the fish concentrate. These location I like to cal, salmon 'fishtrails'. Like 'game trails,' they are very specific and it is only a matter of time before salmon will move along them. When I have been fortunate to locate one of these 'fishtrails' I will anchor in a position that will allow me to cover the head of the trail where the salmon first come up over the deep edge onto the shoal, ledge or shallow. I use brightly coloured buoys as markers to triangulate where the head of this 'fishtrail' is located and, it is there that I concentrate my casting. I have one location on the west side of Texada Island that extends out into the Strait of Georgia like a giant underwater shoe. The marine chart tells me that this area will hold baitfish because it is shallow like the top of the shoe and, that beside and at the toes, are the 'fish trails' that will bring salmon to this baitfish smorgasbord. 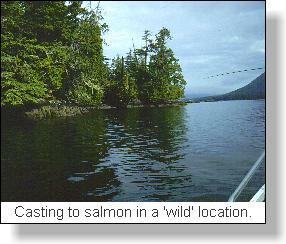 It is one specific area that holds spring bluebacks and summer coho and chinook. When the salmon are on the feed, I have often anchored right at the rocky shore outcrop and fly fished the shelves where the baitfish have tried to hide. My success has been varied simply because it is an exposed location and only reachable during low wind times. 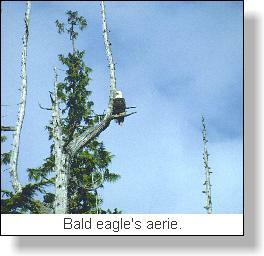 But, it is a location representative of the Bald Eagle's aerie and has provided many exciting and moody moments. Reading saltwater for salmon fly fishing involves many factors including location, tides, baitfish and concentrations of migrating salmon. Resolving the issue of location is one factor that has received very little discussion in the past except for a blanket 'secret' fishing hole doctrine. The use of depth sounders has opened a new era in salmon fishing. The fly fisher is well advised to use this common tool in conjunction with marine charts and land features to locate those salmon 'fishtrails' that provide such an outstanding sport.